Life does not always proceed according to plan. Okay, it almost never does. And besides my self imposed tangents (Squirrel! ), much has changed in my life since I started this blog. 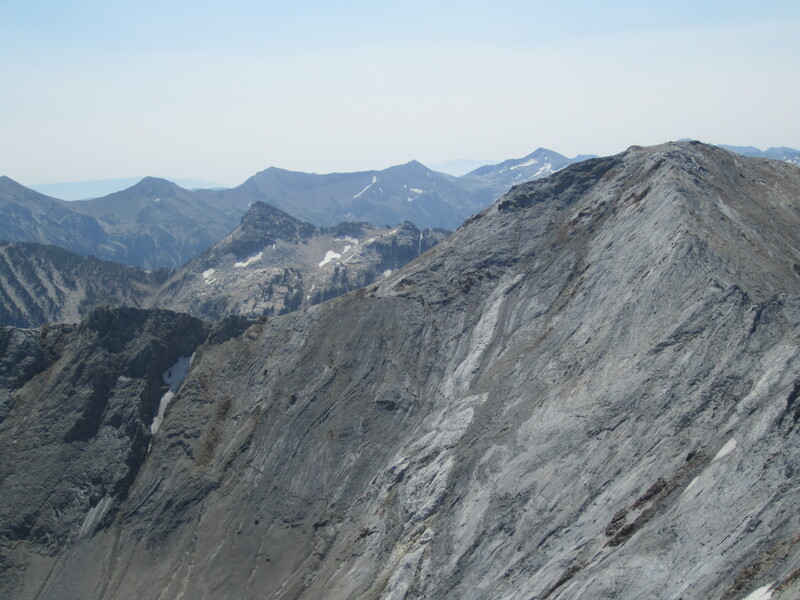 I do not get to climb as many mountains as I like, but I savor memories of trips to the Wallowas, like this gray summit day on Eagle Cap where I was surprised to see a squirrel at well over 9000 feet. I hope to continue feeling grateful for what I do have, like a great family, and what I am able to do, such as hiking on occasion rather than what I do not have or have not done. Happy Thanksgiving, and happy hiking. Ah, memories. Here is a look toward Needle Point from the backside of Eagle Cap in the Wallowa Mountains from a trip a few years ago. While not a spectacular photo, it’s a spectacular location. 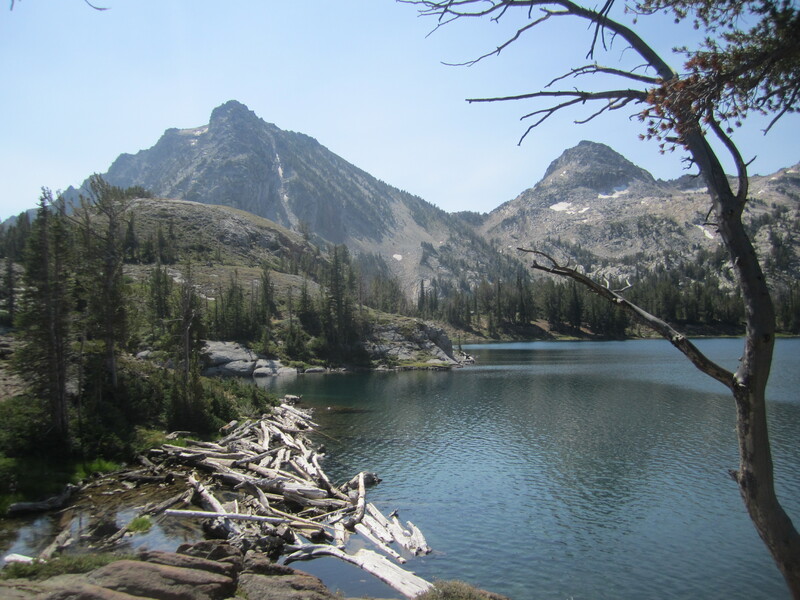 The hike from my camp in the gorgeous Lakes Basin was not too challenging, although this would be a fairly difficult one day hike. I debated going off trail further toward Glacier Peak, but the weather was a bit iffy. 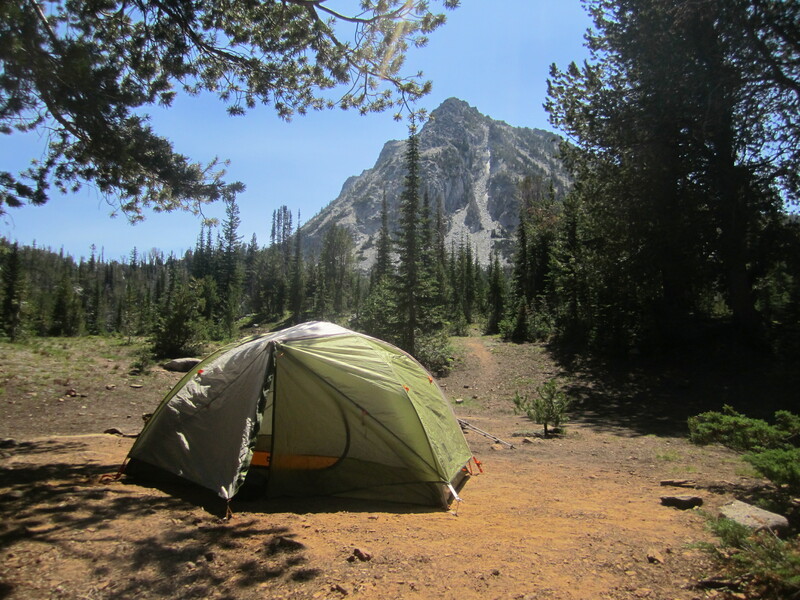 I hope to revisit the Wallowas next summer. 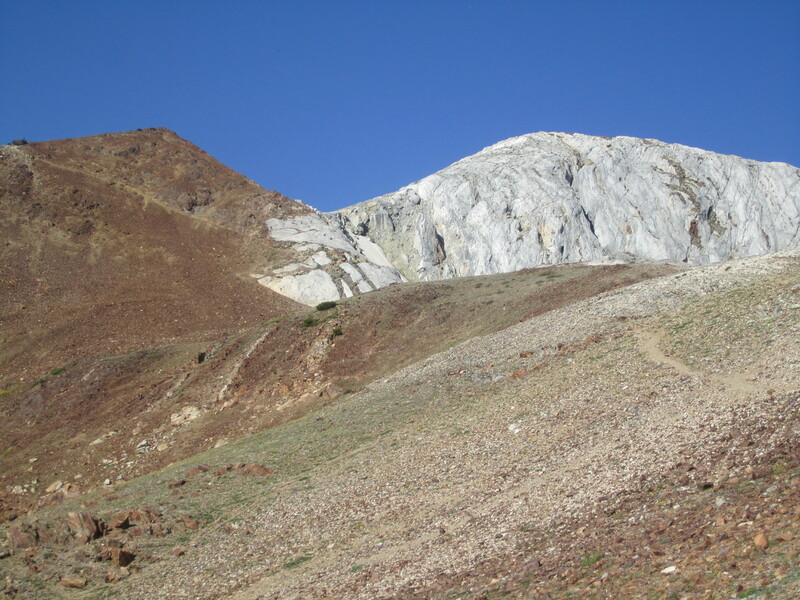 It is a prime hiking and scrambling area. 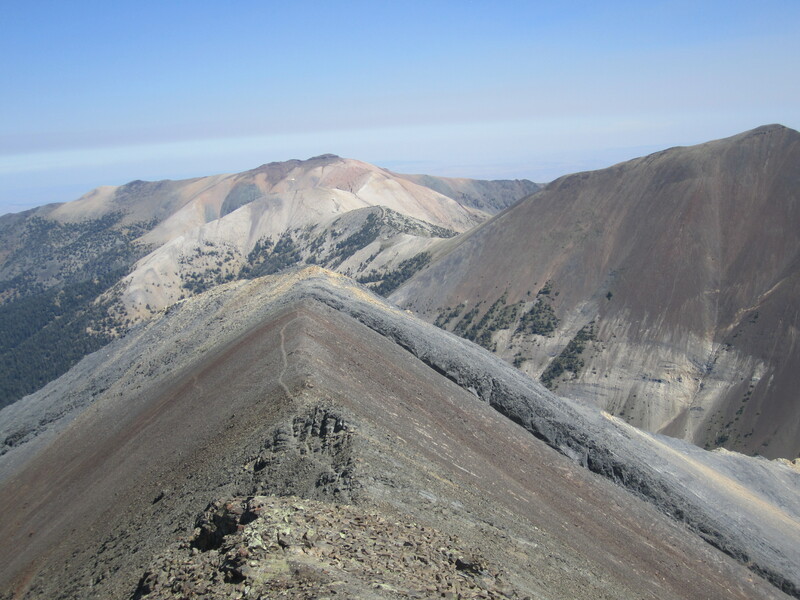 For hikers, the Wallowa Mountains are one of the most stunning areas in the Pacific Northwest. It’s a land of rocky 9000 foot peaks, emerald lakes, and long lush river valleys dotted with meadows. I went there in August for some peakbagging and camped at Ice Lake after bagging a minor peak my first day. My sights were set on the two highest peaks in the area, Sacagawea and Matterhorn, which are connected by a narrow ridge. I’d read on Summitpost about the traverse between the peaks, and it sounded amazing. 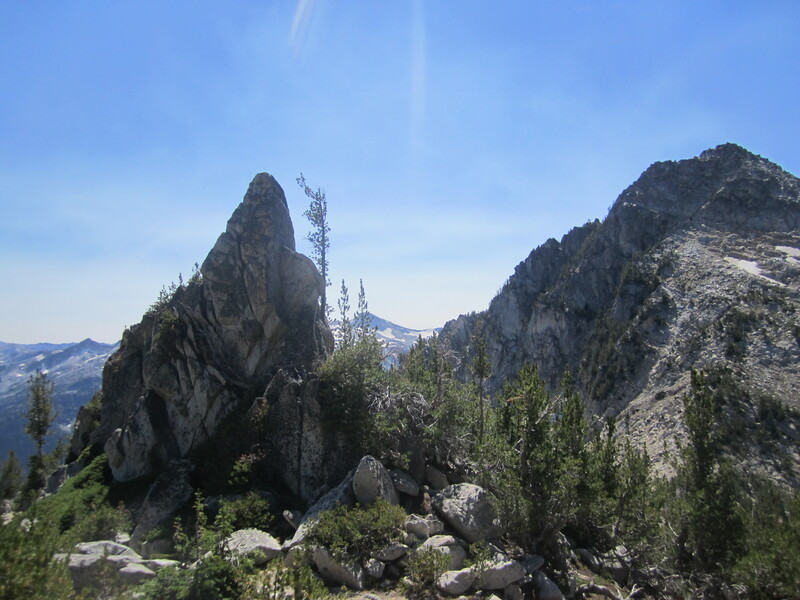 The route was almost completely above treeline, would involve scrambling, and there would be spectacular views. For me, it might be a bucket-list-worthy adventure. I woke early and set out, my legs a bit leaden as I climbed away from the lake. I needed coffee, but I plodded onward and upward without it, the Matterhorn’s massive slopes of white limestone enticing me, juxtaposed with a reddish rock apparently volcanic in nature. Amazing stuff. A limestone tongue interrupts the rusty hues of the Hurwal Divide. My final descent was just out of the picture to the left. Two thirds of the way up, the rest of the route became clear, and I took time to rest. As I sat, two people passed me. 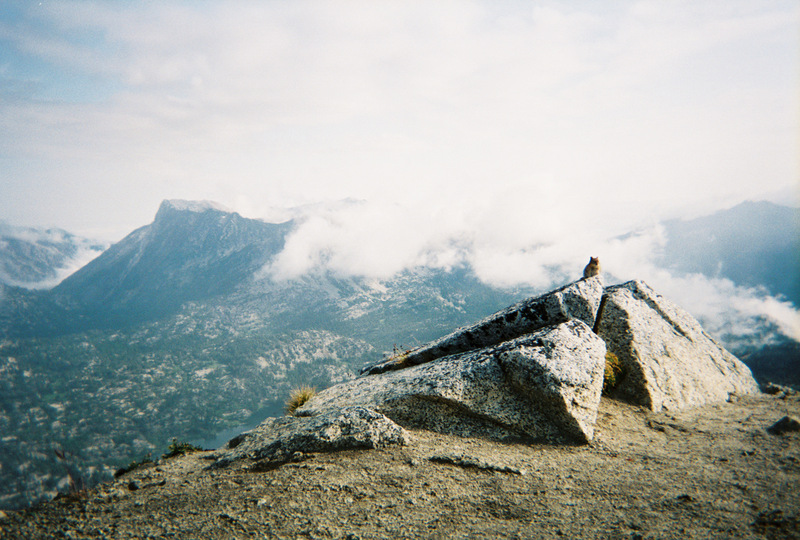 I felt slow, old, and out of shape, even after a good summer of hiking. The mountain was humbling me. Soon, I was hiking diagonally up a steep reddish slope denuded of vegetation, a gulf opening up to my right. Then I crested a ridge of sorts and got views to the south. From there, it was a rocky scramble up limestone. The man and woman who had passed me were standing on one of two summit points, so I joined them. 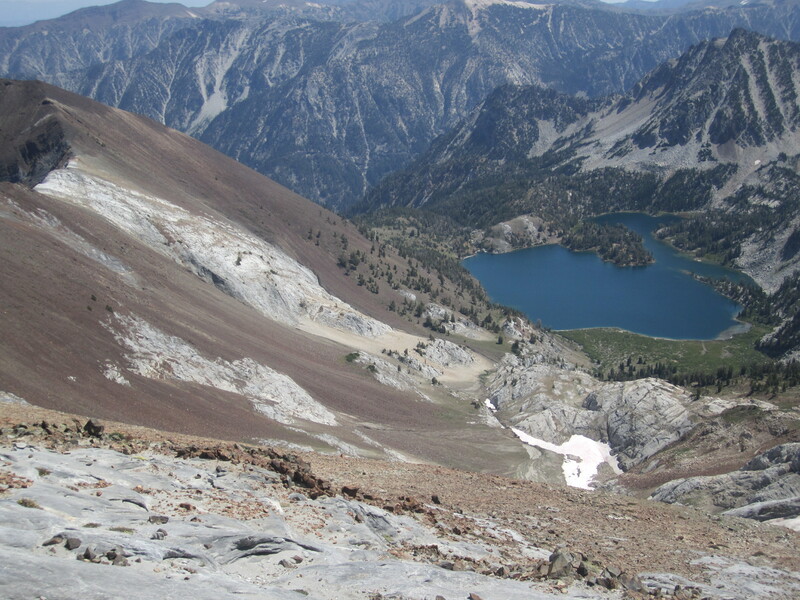 She had started from the Wallowa Lake trailhead at six a.m., hiking eleven or twelve miles with five thousand feet of elevation gain in under four hours. Impressive. When I found out she was a Forest Service wilderness ranger, it all made sense. 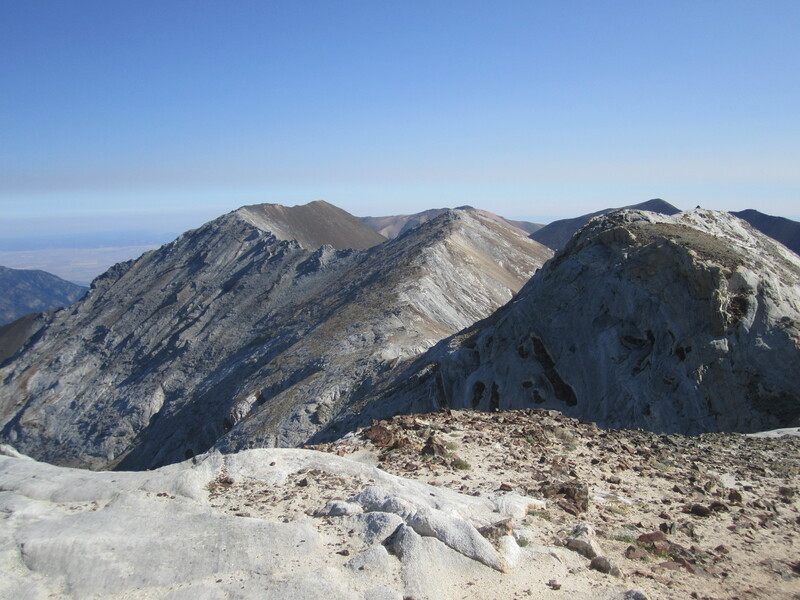 After we exchanged pleasantries, the others headed down, while I sighted down the long ridge north toward Sacagawea. The adventure really began here, where the trail ended. As I descended, I found fist to football-sized rocks of a basaltic nature scattered like rust-colored sprinkles on the limestone. There were also little limestone benches that almost seemed like sculptures. Truly strange geology. Funky limestone bench. Part of Eagle Cap and Needle Point in the background. After bypassing a subpeak on the ridge, I wound my way through, around, and over various gendarmes on the ridge, steep drop offs on either side. The going was more complicated than expected. I had to choose my route and use my hands more than expected, so I tucked my trekking poles behind my back and tried to think of myself as a mountain goat—okay, an aging one with a spare tire. It worked. One of the many gendarmes. Probably twenty five high. Sacagawea summit in background. I cleared the gendarmes in fifty minutes and soon was atop Sacagawea’s rockpile summit, where the sublime view opens up to the north and the colorful slopes of Twin Peaks and Chief Joseph Mountain. Where I’d felt old earlier, I was an ecstatic kid now. It was not yet noon and I’d bagged my second peak of the day. Woo hoo! I signed the summit register, then relaxed on a perfect throne rock while I ate, drank, and contemplated my place in the universe. And it was good. I wondered if anybody would scale the East Ridge from the Thorp Creek Valley below, but nobody appeared. In fact, I hadn’t felt such solitude in years. I could have stayed up there for hours, but I also like to move, and move I did. 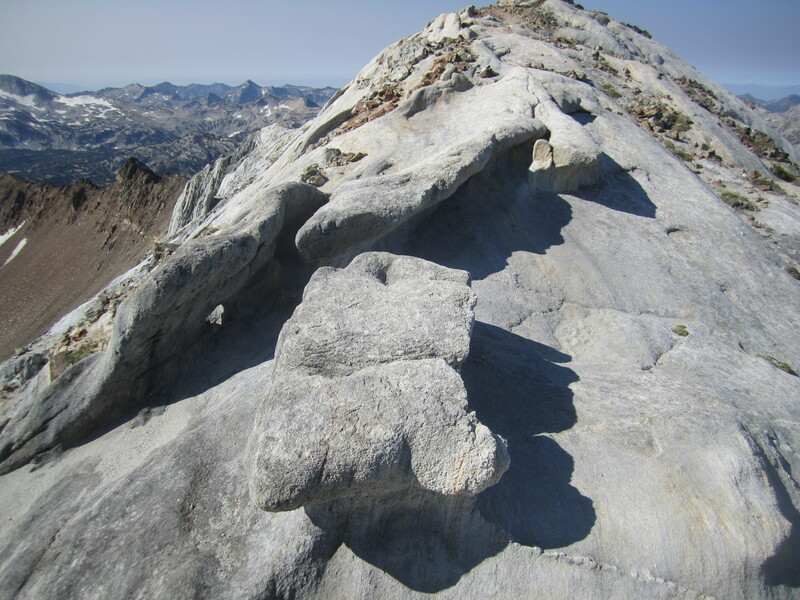 I wanted to vary my descent route so I could avoid re-climbing the Matterhorn summit block. 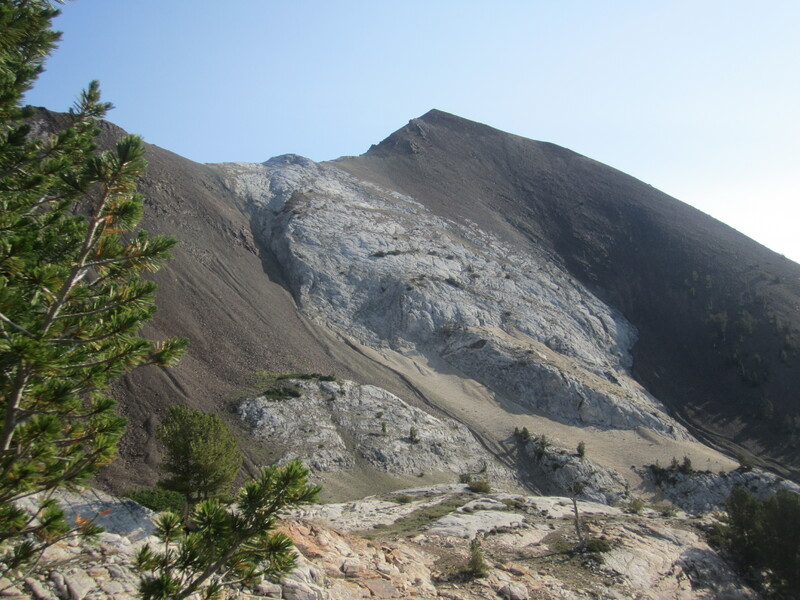 Instead, I’d drop down the east ridge of Point 9775, then descend the massive scree slopes to the south. Point 9775 on the right from Sacagawea. My descent would drop down the east ridge toward the dark area on the left, then plunge off the backside. Clambering over the gendarmes felt trickier in reverse, confirming that it was not for the inexperienced or those who fear heights. I also found Point 9775 to be a fine summit, perched as it is between Matterhorn and Sacagawea, with great looks at Hurwal Divide to the east and Hurricane Divide to the west. The descent from Point 9775. 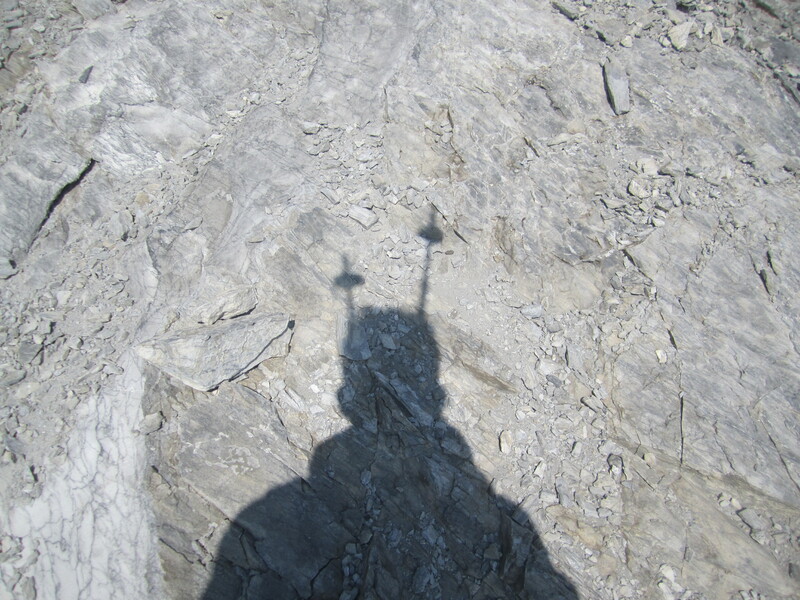 Compare with the third picture on this post (from the Matterhorn ascent). 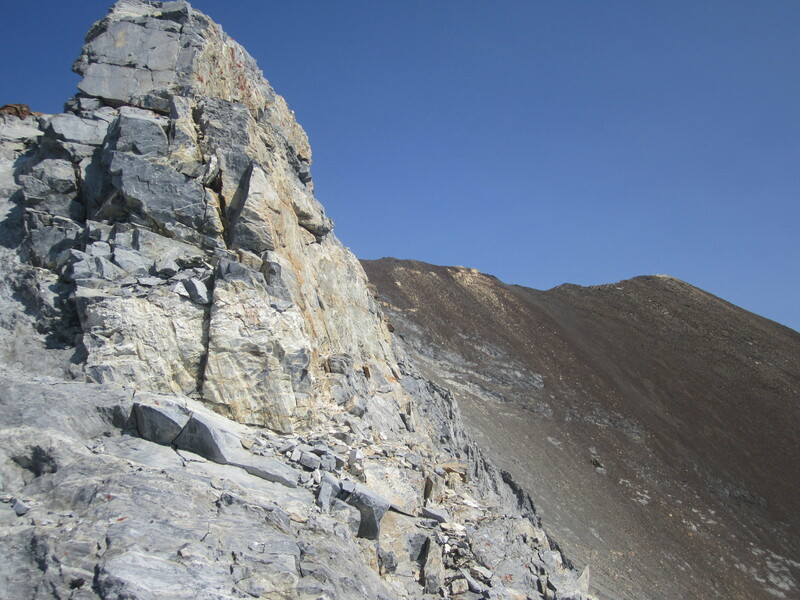 The start of the descent was tricky, the surface constantly shifting from solid limestone to loose basalt chunks to ball-bearing scree over limestone, and finally a long slope of just sandy scree where I could move quickly. Near the bottom, a flash of white caught my eye. 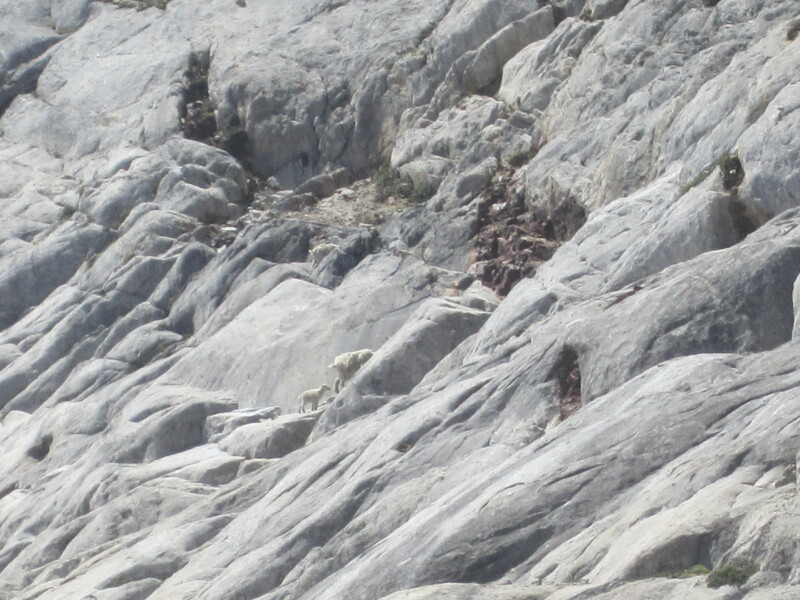 Mountain goats! I tried to get close enough for good photos, but they kept moving, clambering from the wildflower basin onto a limestone crag. It felt like the perfect ending to my adventure. “We don’t need no stinking rope,” sayeth the goats. Steeper than it looks. I returned to my tent about two p.m., pleased with the day’s travels. It seemed amazing that I’d covered so much ground, and it was all great hiking and challenging scrambling with stunning views. I would recommend the off trail section of the route only for confident scramblers, while trail hikers can still bag Matterhorn by itself. Either way, you can’t lose in the heart of the Wallowas. My hunch was right. These peaks definitely provide bucket-list worthy adventure, even for aging mountain goats. 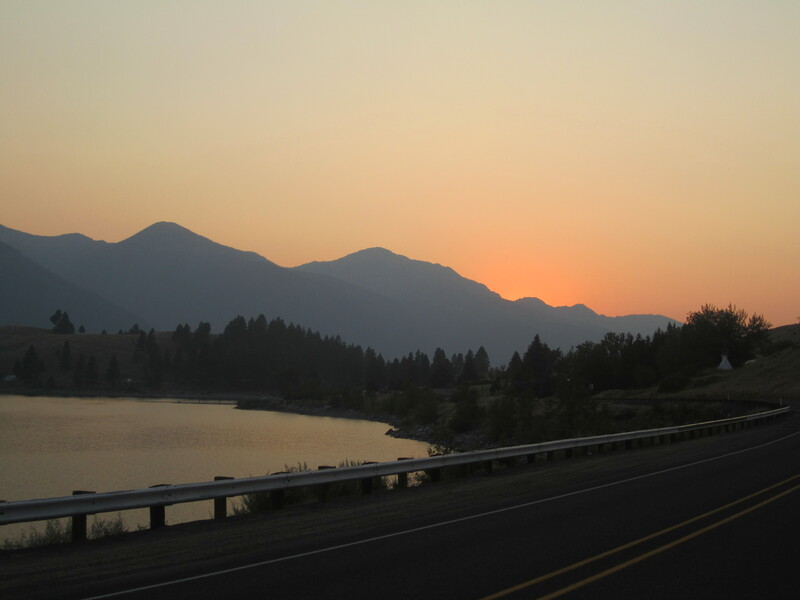 Wallowa Lake curls slightly, like an index finger beckoning travelers to stop and play. Just a mile south of the quaint town of Joseph, Oregon, the lake acts as gateway to the Wallowa Mountains, nicknamed the Alps of Oregon by a tourist commission genius somewhere. 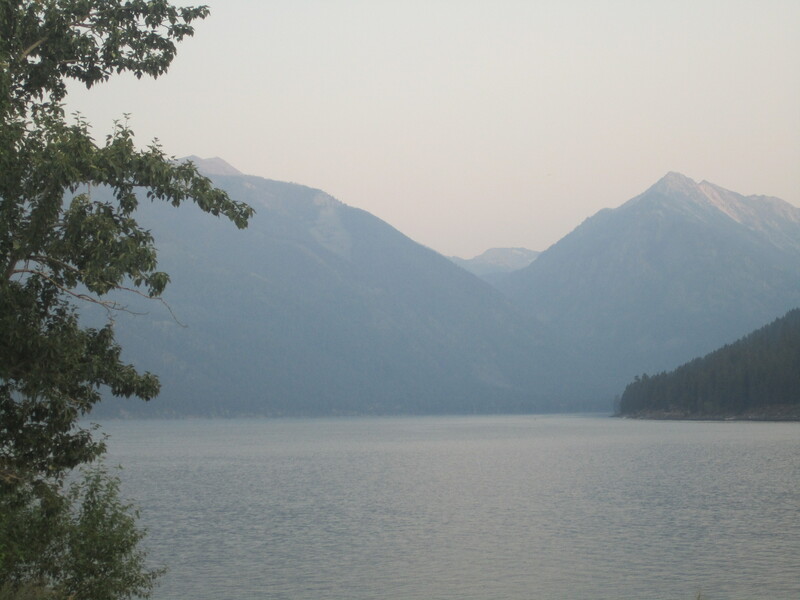 Looking south down Wallowa Lake in a soft twilight. A county park geared toward waterplay sits at the north end of the lake, complete with a swimming area, boat access, and picnicking. The backdrop is spectacular, a photo-worthy view into the mountains to the south, the massive wall of Chief Joseph Mountain to the west, and a high glacial moraine to the east. 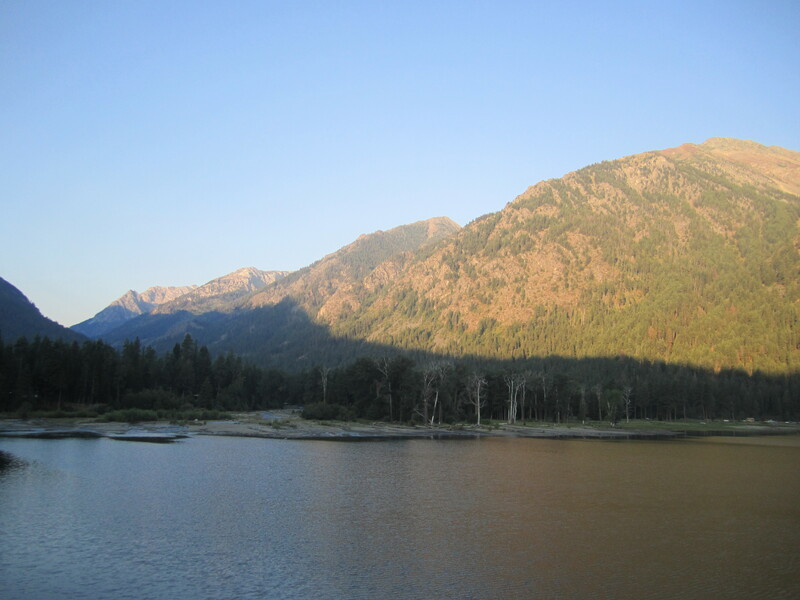 At the far end of the lake, there is a forested resort area centered around Wallowa Lake State Park. 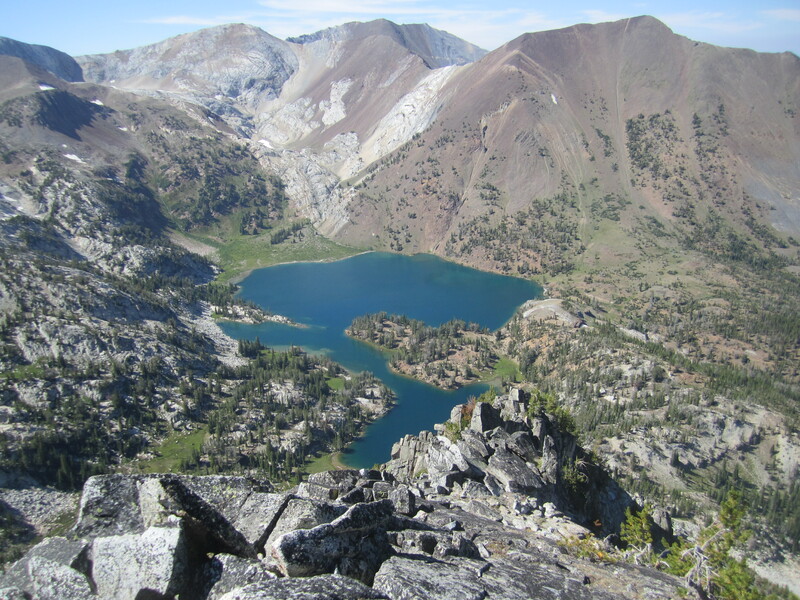 The area has camping, lodges and cabins, the cheesiness known as miniature golf, and access to the hiking trails that lead into the Eagle Cap Wilderness. There is even a tram that leads to the top of Mount Howard. It makes me wish I had more time. Alas, I’d arrived in the evening, with little time to hike, so I scoped out the trailhead, had a nice meal at a Mexican restaurant in Joseph, then caught a spectacular sunset at the lake. Afterward I found a room and went through my gear, almost panicking when I briefly misplaced my camera. Goofball. Amped up, I pored over the map before falling asleep. 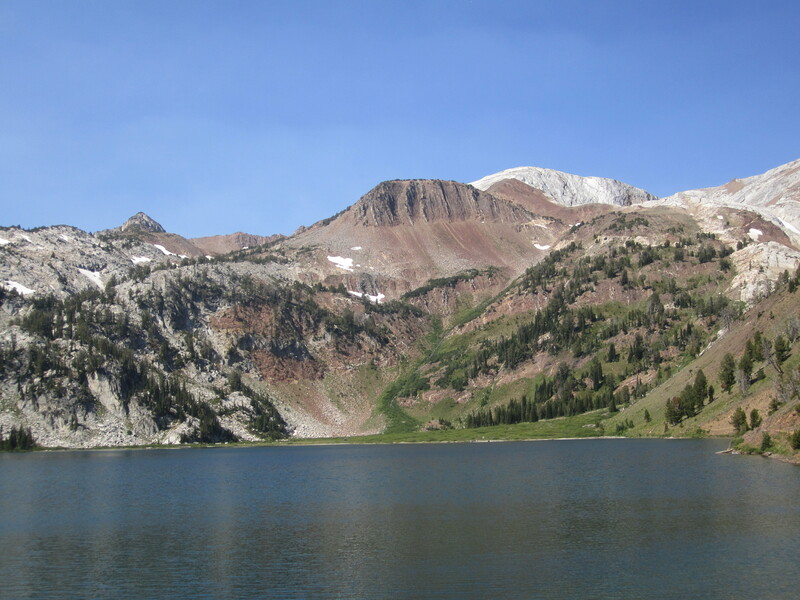 Ice Lake was about a nine mile hike, in its own basin separate from the more popular lakes at the foot of Eagle Cap. I finally zonked out, and when I woke, I quickly packed, then cruised to the trailhead, where I got front row parking. A good omen, I thought. I have a few gulps of water, fill out a wilderness permit, and start hiking. I haven’t done the full backpack gig in a couple years, and I move a bit slowly. The pack feels heavier than I’d hoped, but I’m pleased to be hiking before 7 a.m. I have a lot of daylight for hiking, and it looks like a gorgeous day. The first hour is casual. Then the Ice Lake trail splits off. While it’s not steep, it’s relentlessly uphill with way too many switchbacks for my liking. 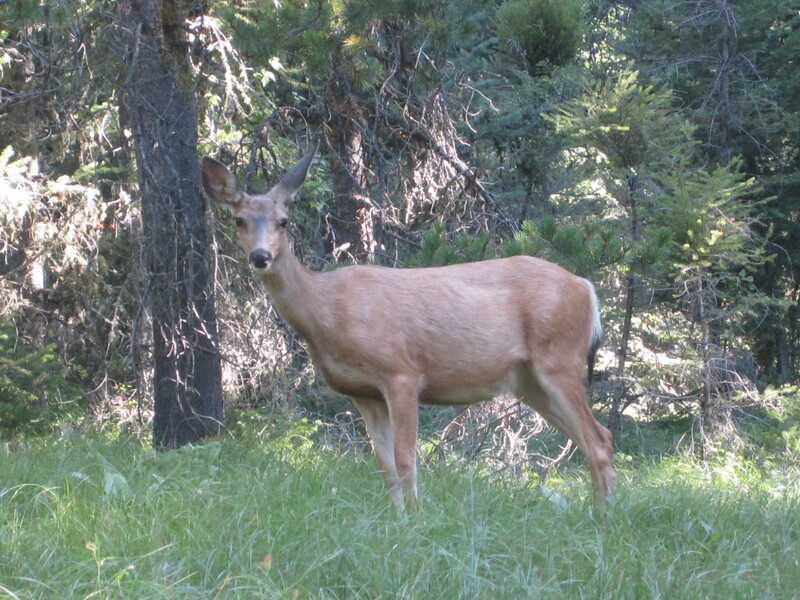 I rest beneath a tree at one point, and a deer comes close to munch vegetation, eyeballing me curiously. After paying for my views with sweat, I crest the final hill, arriving at Ice Lake shortly after 11 a.m., tired but pleased. The lake sits in a tremendous bowl surrounded on three sides by peaks, varied in appearance, comprised of a variety of rock: limestone, granite, and basalt. After relaxing, hydrating, and munching, I set up camp. Afterward, I realize I still have a lot of daylight. Could I climb a peak today? I contemplate the map and spy Craig Mountain to my southeast, the peak lurking above me on the second half of the hike. It’s a humbler peak, but still worthy at over 9000 feet, and it seems feasible. At two p.m., I set off around the lake toward an obvious approach gully to the mountain. 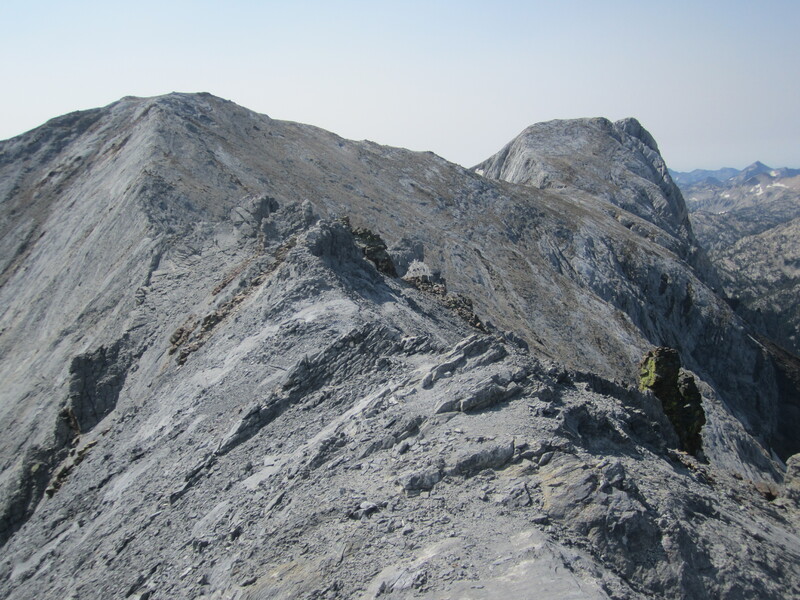 I soon find myself scrambling up tremendous slabs of granite, winding through dusty scree slopes. The slopes get steeper, and I use my hands on occasion. 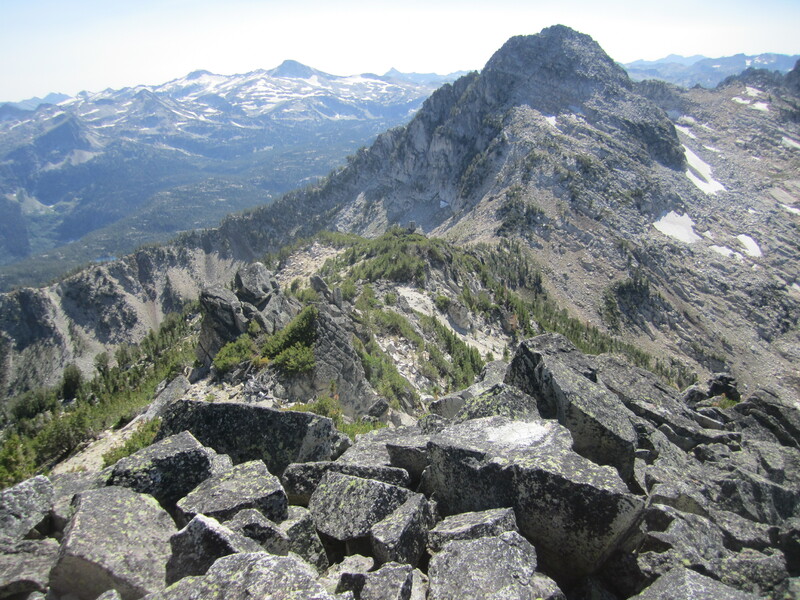 In an hour I reach the crest of an east-west ridge dotted with rock outcroppings and dense stubby pines. I soon get views of Eagle Cap, Cusick, Pete’s Point and more. To continue upward, I must thrash my way through very tight trees. It is not pleasant. At one point I am ready to retreat, but I find more open ground south of the ridge crest, along with awesome views. Lots of rock hopping or scrambling ensues,but the route is clear, and I top out in less than ninety minutes from the lake. 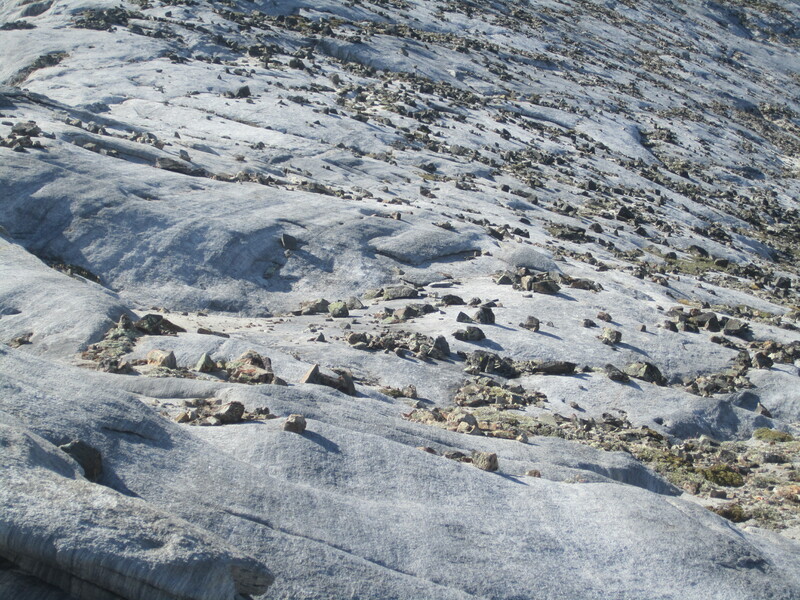 Craig’s summit is small and rocky, with views in all directions. I relax and snap some photos, then manage to send a text to my wife and stepson (whose middle name happens to be Craig). It is warm, and from above, Ice Lake looks swim-worthy. Descending, I take my chances with scree gullies rather than fight the pines again. There are moments I need to downclimb granite for ten feet or float down a fifty degree slope of sand mixed with occasionally solid rock. My descent is faster, but it is not without a few pucker-factor moments, and while I am happy to have climbed the peak, the route will not make my top ten list. After a leisurely exploration of the lake’s lush shoreline, various tiny waterfalls and granite crags, swimming calls. 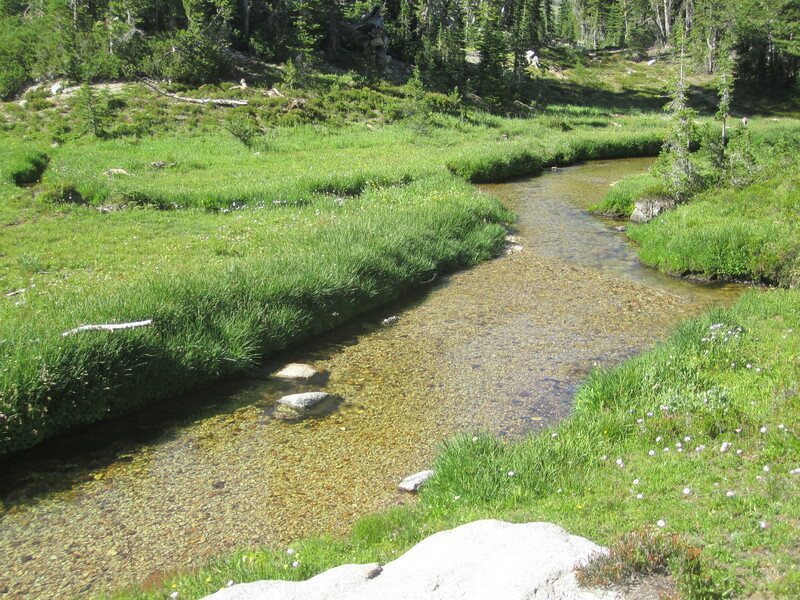 Inlet stream on south side of Ice Lake. Stress evaporates in this scenery. It has been a good day, and I enjoy the onset of evening. I even see a single meteor blaze down the night sky. I’m not usually one for omens, but what the heck, I’ll take it.